In just 90 square kilometers (35 square miles) in and around Mt. Panié Reserve live all the world’s New Caledonia kauri (Agathis montana). The species is an endemic conifer, which local people revere as guardians of their mountain and host to the spirits of their ancestors. Kauri are commonly called Millennium Trees for good reason, as carbon dating reveals they can live well beyond a thousand years. But after living for centuries, many are dying off for reasons scientists don’t yet completely understand. According to Conservation International, indigenous groups began reporting the die-off in 2009. Subsequent surveys found more trees to be dying than can be naturally replaced by the next generation. Coupled with the kauri’s long generation time – scientists believe it takes 500 years for them to reach reproductive maturity – this rate of decline may make it difficult for the species to persist. “Within 100 years…there would be no mature trees left,” researchers wrote in a 2014 IUCN assessment. 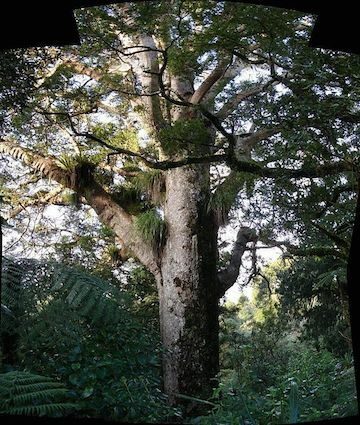 An Agathis australis, a New Zealand kauri species similar to the New Caledonia kauri (Agathis montana). Photo by Tatiana Gerus. Scientists and conservationists are puzzling over the causes of the kauri die-off, with four main threats suspected: erosion and disturbance caused by feral pigs, disease, insect infestation, and global warming. 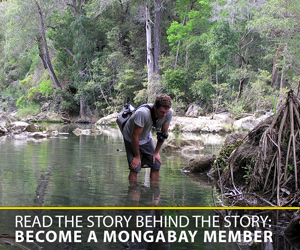 “It took some time to prove that mortality is not natural, but rather a factor that remains unidentified to this day,” Cyrill Sabran, director of local NGO Dayu Biik, told mongabay.com (communication translated from French). Dayu Biik, which means “strong and flexible kauri” is specifically focused on the preservation and conservation of Mt. Panié Reserve. According to the IUCN assessment, which Sabran co-authored, a layer of moss 20 to 50 centimeters (8 to 20 inches) thick used to cover the much of the forest floor in the region. But now moss is found only in small, isolated patches. Dayu Biik is part of a research group investigating the causes of the kauri die-off. As of now, they are still in the process of completing their study. However, in addition to moss cover, several changes have hit this area of New Caledonia in recent decades. Analyses of local weather records revealed a temperature increase of 1 degree Celsius over the past 40 years. Scientists speculate that this may change the microclimate of kauri forests and lower their humidity levels, which may, in turn, be encouraging more feral pigs to invade the kauri forests. Studies of feral pig populations on other islands found they forage at higher elevations during droughts and can significantly disturb soil and flora. Feral pigs are also known to spread soil-borne diseases such as Phytophthora cinnamomi, a fungi-like microorganism that has been linked to tree die-offs in the Mediterranean and New Zealand. In July 2012, a Phytophthora species was found on trees in the kauri forest, but it is not known what species it is, or whether it is native or was introduced. However, while researchers suspect pigs may be having a hand in the kauri die-off, it’s far from certain. “Feral pigs could be one of the threat for the kauri, but nothing has been firmly proved yet,” Nathalie Baillon of the Natural Species Conservatory of New Caledonia (CEN) told mongabay.com. The kauri forests aren’t the only at risk on New Caledonia. Global Forest Watch shows the archipelago lost approximately 11,700 hectares of tree cover from 2001 through 2012 – an area more than twice the size of Mt. Panié Reserve. Multiple initiatives are currently underway to safeguard the kauri that remain. A management plan started in 2012 increased monitoring effort, and more stringent control of feral pigs is slated to begin this year. In addition, according to Conservation International, the Mt. Panié Reserve will be enlarged to include all kauri habitat. But as of yet, it is unknown whether or not this will be enough to save the Millennium Trees from extinction in the long-term. New Caledonia boasts the world’s largest protected area. However, this doesn’t mean much for its land, which remains largely unprotected. In fact, according to Global Forest Watch, Mt. Panié Reserve is the only official protected area in the northern half of the main island. Click to enlarge. Constança De Sampaio E Paiva Camilo-Alves, Clara, M., & Ribeiro, N. (2013). Decline of Mediterranean oak trees and its association with Phytophthora cinnamomi: A review. European Journal of Forest Research,132(3), 411-432. Hansen, M. C., P. V. Potapov, R. Moore, M. Hancher, S. A. Turubanova, A. Tyukavina, D. Thau, S. V. Stehman, S. J. Goetz, T. R. Loveland, A. Kommareddy, A. Egorov, L. Chini, C. O. Justice, and J. R. G. Townshend. 2013. “Hansen/UMD/Google/USGS/NASA Tree Cover Loss and Gain Area.” University of Maryland, Google, USGS, and NASA. Accessed through Global Forest Watch on Feb. 12, 2015. www.globalforestwatch.org. Hansen, M. C., P. V. Potapov, R. Moore, M. Hancher, S. A. Turubanova, A. Tyukavina, D. Thau, S. V. Stehman, S. J. Goetz, T. R. Loveland, A. Kommareddy, A. Egorov, L. Chini, C. O. Justice, and J. R. G. Townshend. 2013. “Tree Cover Extent.” University of Maryland, Google, USGS, and NASA. Accessed through Global Forest Watch on Feb. 12, 2015. www.globalforestwatch.org. UNEP-WCMC, UNEP, and IUCN. “World Database on Protected Areas.” Accessed on Feb. 12, 2015. www.protectedplanet.net. (12/29/2014) In what was widely seen as a possible breakthrough in the battle to coordinate some kind of response to global warming, China and the U.S. announced joint actions this year. On November 12th, the world’s two most powerful countries surprised pretty much everyone by announcing that they would work together to tackle the crisis. (05/02/2014) The government of New Caledonia last week officially created the world’s largest protected area, establishing a multi-use zone that at 1.3 million square kilometers is three times the size of Germany, reports Conservation International (CI). (04/08/2014) Sea levels are rising at the highest rate in thousands of years, putting at risk low-lying islands around the world. In a new study published in Nature Conservation, researchers found that projected rises in sea level stand to swamp more than 10,000 islands, displacing human communities and wiping many unique species off the face of the earth. (10/29/2013) In early 2011, Conservation International (CI) dubbed the forests of New Caledonia the second-most imperiled in the world after those on mainland Southeast Asia. Today, CI has released the results of a biodiversity survey under the group’s Rapid Assessment Program (RAP) to New Caledonia’s tallest mountain, Mount Panié. During the survey researchers rediscovered the ‘lost’ crow honeyeater and possibly sixteen new or recently-described species. Over 20 percent larger than Connecticut, New Caledonia is a French island east of Australia in the Pacific Ocean. (02/06/2011) On February 2nd, Conservation International (CI) released a list of the world’s top 10 most threatened forest hotspots. The original press release incorrectly named New Zealand as number two, when in fact it is the island of New Caledonia and the surrounding East Melanesian islands. (09/04/2008) The Crested Gecko is endemic to South Province, New Caledonia in the South Pacific. While the species is widely kept in the pet trade, the species was long believed extinct in the wild until it was rediscovered in 1994. It is now known to have three distinct populations and its conservation status is currently being evaluated by the IUCN. Trade in wild-caught individuals is presently banned.